The newly launched Airwheel two-wheeled intelligent scooter S3 just made a public appearance in Netherlands recently. You can steer this two-wheeled self balancing scooter smoothly just like Harry Potter flying on his broom. Municipal construction department also has great expectation in this handy transporter which is easy to control and might help reduce the pollution caused by car after it gained its popularity. Airwheel two-wheeled scooter S3 is an artwork with perfect designed tire, power unit and sensor system. This two-wheeled scooter is powered by rechargeable Li-ion batteries and will not emit noise or exhaust like a car. 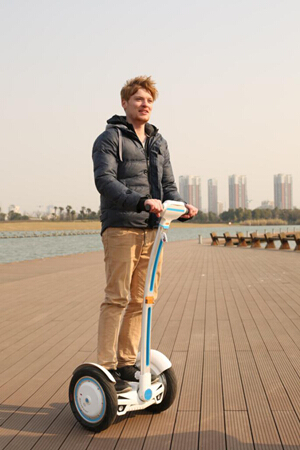 It can work successfully as it is equipped with complex micro-gyroscope and intelligent system which can simulate human balance just like the human inner ear structure and central nervous system regulating the body balance, and the sensor is working as human eyes and skin to transfer the data of external changes to the intelligent system to make sure the two-wheeled scooter S3 will not fall over while riding. The riders can control the two-wheeled scooter by leaning body forward and backward, and twist the body to turn direction. This two-wheeled scooter is popular all over the word. It is not only welcomed by young people, but also applied in some import conference.